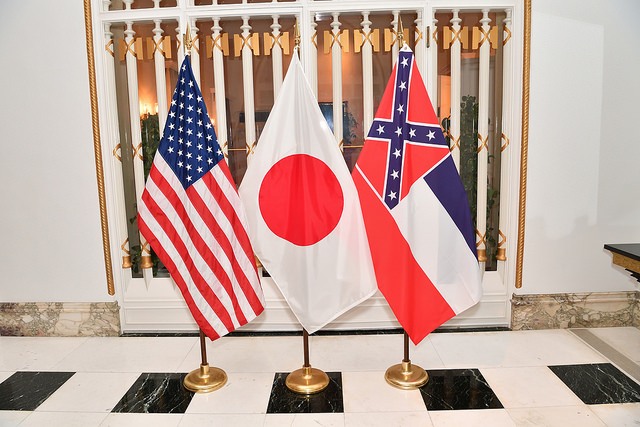 On May 21st-25th, major companies delegation of Mississippi States led by Governor Phil Bryant visited Japan. Among all the states of the United States, the largest direct investment from Japan is Mississippi State, which is said to be about 2 billion dollars. We supported arranging and accompanying B2B meetings between missions and domestic companies. On May 22, “Doing Business in Mississippi” seminar was held by JETRO and the state government at JETRO Tokyo office. Mississippi State is located in the southeastern part of United States and in recent years, large-scale investment deals are in succession not only in automobiles but also in logistics warehouses, food processing, aerospace, energy, shipbuilding and other industrial fields. At the seminar, the state government introduced the appeal of the state and government support measures, and on behalf of Japanese companies entering, Toyota Auto Body, Calbee and Nissan Motor talked about their experiences of doing business in Mississippi. Also on May 23, reception was held at the US Embassy in Tokyo and speeches were received from representatives of the delegates including William F. “Bill” Hagerty IV U.S. Ambassador to Japan. In the speech, Governor Phil Bryant thanked for the existence of investment from Japan and also for the Japanese companies that are entering. There was also a speech from Governor Omura of Aichi Prefecture and he talked about a strong connection between Mississippi State and Aichi Prefecture and a future prospect. During the reception, we had also introduced the delegation to some of the major construction company and car component manufacturer.